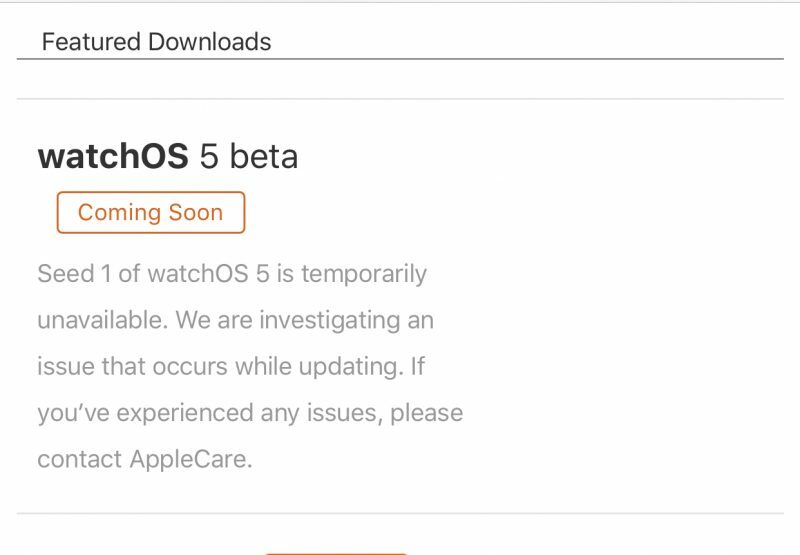 Apple appears to have temporarily pulled the first watchOS 5 beta from its website after some users reported cases of the software bricking Apple Watch devices. Several users on the MacRumors forums and over on Reddit have expressed problems trying to get the software onto their devices, with freezes reportedly occurring during the installation phase, particularly on Apple Watch Series 2 models. Seed 1 of watchOS 5 is temporarily unavailable. We are investigating an issue that occurs while updating. If you've experienced any issues, please contact AppleCare. Both the watchOS 5 configuration file and the over-the-air update have been removed, and right now it's unclear when they will return. As is often the case, initial software beta releases can be susceptible to bugs and issues which only reveal themselves during device propagation. We'll update this article when Apple fixes the problem and makes a revised version of the beta available once more. Anyone who isn't a developer with a separate device for testing is taking a huge risk by installing a watchOS beta. It's crazy to me that non-developers are installing these developer betas on their watches. The fact that there are never public betas of watchOS should be enough to dissuade people, but apparently not. Apple software is still buggy! Thanks to all you [S]poor suckers[/S] pioneering trailblazers who test! Cue the comments, see Apple's software is still buggy*. * It's a Developer release, it might contain bugs like this one. There's a reason that Apple highly highly recommends you install the betas on only test devices. Too many non-developers join in just to get the new versions early and suffer the consequences. It's a beta. There's bound to be issues. That's why you always put beta software on something OTHER than your primary device. I was super nervous during the update. My watch stayed on the last “tick” for about 15 minutes, and when it finally completed I was stuck in boot loop. Eventually I force reset it and it booted normally. Guess I got lucky.